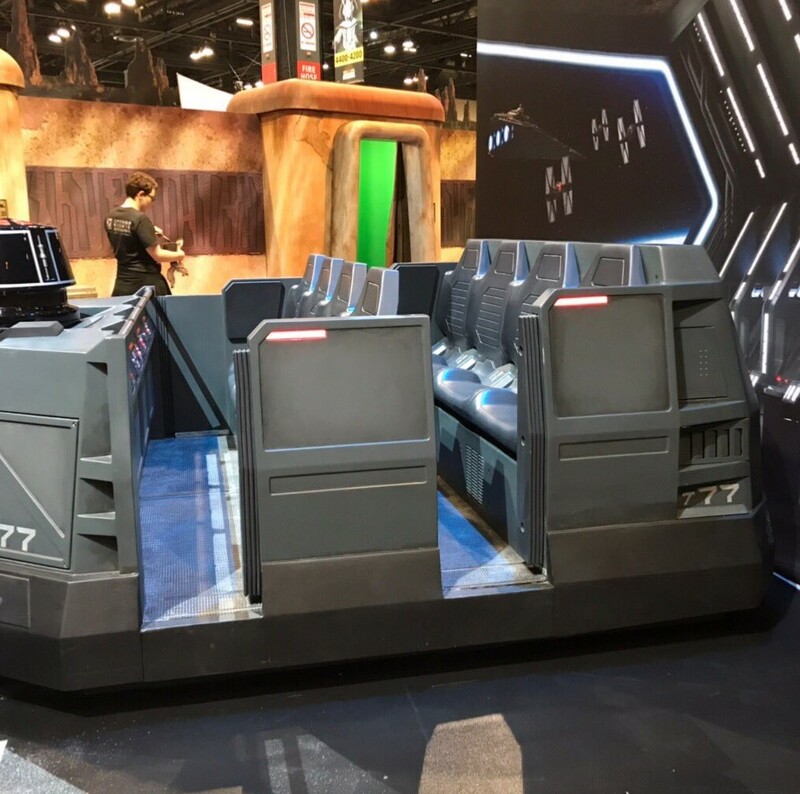 The Rise of the Resistance ride vehicle is on display for attendees of Star Wars Celebration in Chicago this weekend. 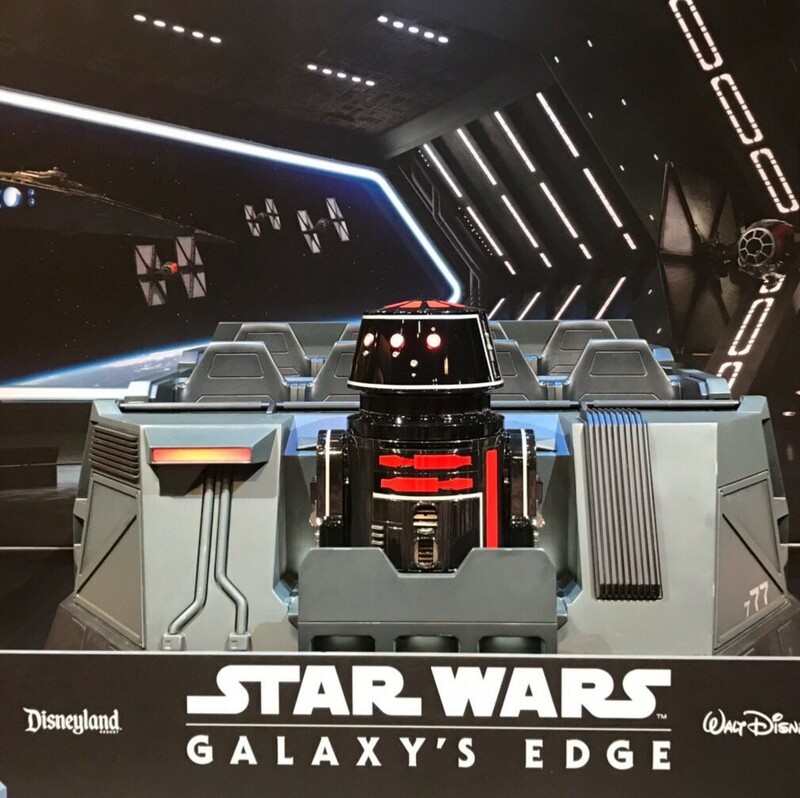 Guests are able to hop aboard the First Order Fleet Transport ride vehicle for a photo op while at the convention. Twitter user @traceyheinrichs posted the below photos. Of course, this isn’t the first time that we’ve seen the actual ride vehicles. We last saw them thanks to a photo from inside the attraction, taken by the Disneyland Test and Adjust team. For the latest look at the construction progress on Star Wars: Galaxy’s Edge, check out our recent aerial tour of the construction site. Isn’t that the cars from the Great Movie Ride they just closed? Looks the same with a new coat of paint and bucket seats added. And they are a tad shorter. But where the little robot is, is where the guide used to stand? Guess they were recycled for this new ride. I guess it better to reuse them then just toss them out. I know they need to make new rides and all, but I think Hollywood Studios is losing it’s Hollywood Charm. We go to Disney because it’s different then all other amusement parks. It’s definitely the most Family friendly and safe. Adults, Grand parents, children can all ride the same rides. It is what Walt Disney wanted. Now the Imagineers are going a little off course, the rides are getting too adult and crazy. I don’t think Walt would like the direction they are going. I especially know the Walt Disney would not like what they did to his Beloved Mouse. The new Stick Figure cheap TV version of Mickey & crew would turn his stomach, bet he would be very angry. Would love to ask animator why Goofy now looks like a homeless bum with flies around him? Who’s idea was that? It’s creepy. He actually looks perverted. Sorry got off track. Hi Judy! I hope you’re doing well! These use a completley different ride system for navigation than the Great Movie Ride did, so I assume these are new ride vehicles. The Great Movie Ride cars followed a wire embedded in the floor and the speed was controlled by the host. These vehicles use a Local Positioning System (think the GPS your phone uses, but inside a building) using technologies like WIFI, Bluetooth, and NFC (near field communication, the tech in your phone and your Magic Band that lets you pay at Starbucks and enter the parks) along with a computer that controls each car individually. This allows the cars to take guests in many different, even random(! ), paths throughout the attraction, as there’s no set path in the floor or rails to follow. Plus, the dimensions seem to be significantly different. The Great Movie Ride cars could hold probably a hundred guests, but these are limited to 8. As for Hollywood Studio’s new direction, everyone is of course entitled to their own opinion, but each of the “studio” type parks (Hollywood Studios in Florida, Walt Disney Studios Park in Paris, and Disney California Adventure in Anaheim) are losing their studio feel. I actually like this change. Sure, it’s cool to feel that you’re walking on a studio set, but there’s no comparison between walking between the tan studio buildings and stepping into Pandora or Batuu. Though I will say I’m afraid Hollywood Studios will lose its identity compared to the other parks. What its theme be if it the rest of the park is replaced with Galaxy’s Edge and Toy Story Land-type lands? It can;t be stepping into the movies or fantastic lands, as isn’t that what the other parks already do? As for the new rt style in th Mickey Cartoons, ¯\_(ツ)_/¯. They’re certainly different in the artstyle, but many of them are actually really funny. I can’t unitl the new attraction going into Hollywood Studios opens. Here’s to hoping it’s still in 2019. Sorry for the thesis and spelling.